Add the Roasted Garlic Base, Seasoned Vegetable Base, pepper, onion powder, oregano, Hot Sauce, sugar, lemon juice and butter to a small mixing bowl, stir to combine. 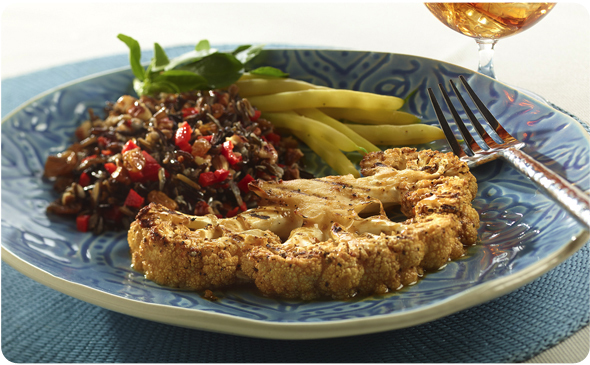 Rub each side of the cauliflower steaks with the mixture, cover and refrigerate for 3 hours or overnight. Preheat the grill to 425°F. Remove the cauliflower from the refrigerator and place each steak directly onto the grill. Grill each steak for 10 minutes per side. Remove the steaks from the grill and serve immediately.